-WHAT ARE THE DIFFERENT PARTS OF A TOOTH? 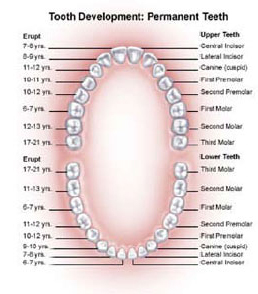 +WHAT ARE THE DIFFERENT TYPES OF TEETH? Canines – sometimes called cuspids, these teeth are shaped like points (cusps) and are used for tearing food. Premolars – these teeth have two pointed cusps on their biting surface and are sometimes referred to as bicuspids. The premolars are for crushing and tearing. 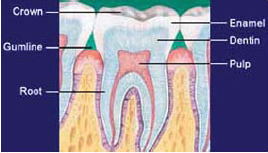 Molars – used for grinding, these teeth have several cusps on the biting surface. “Cavities” is another way of saying tooth decay. Tooth decay is heavily influenced by our lifestyle, what we eat, how well we take care of our teeth, and the presence of fluoride in our water and toothpaste. Heredity also plays a role in how susceptible your teeth may be to decay. Cavities are very serious. Left untreated, a cavity can destroy your tooth and kill the delicate nerves at its center, which may result in an abscess, an area of infection at the root tip. Once an abscess forms, it can only be treated with a root canal, surgery or by extracting the tooth. -HOW DO I KNOW IF I HAVE A CAVITY? Only your dentist can tell for sure whether you have a cavity. That’s because cavities develop below the tooth’s surface, where you can’t see them. When you eat foods that contain carbohydrates (sugars and starches), these carbohydrates are eaten by the bacteria in plaque, producing acids that eat into the tooth. Over time, the tooth enamel begins to break down beneath the surface while the surface remains intact. When enough of the sub-surface enamel is eaten away, the surface collapses, forming a cavity. +HOW CAN I HELP PREVENT CAVITIES? Fluoride is often added to drinking water to help reduce tooth decay. In the 1930s, researchers found that people who grew up drinking naturally fluoridated water had up to two-thirds fewer cavities than people living in areas without fluoridated water. Studies since then have repeatedly shown that when fluoride is added to a community’s water supply, tooth decay decreases. The American Dental Association, the World Health Organization and the American Medical Association, among many other organizations, have endorsed the use of fluoride in water supplies because of its effect on tooth decay. +HOW DO I KNOW IF I'M GETTING ENOUGH FLUORIDE? If your community’s water is not fluoridated and does not have enough natural fluoride in it (1 part per million is considered optimal), then your dentist or pediatrician may prescribe fluoride tablets or drops for your children to take daily. Your dentist or pediatrician can tell you how much fluoride is right for your family, so be sure to ask for his or her advice. If your water comes from a public water supply, you can find out if it’s fluoridated by calling your local water district. If your water comes from a private well, you can have it analyzed by an independent environmental testing company that provides water-testing services. Sometimes called Baby Bottle Tooth Decay, Early Childhood Cavities is a serious disease that can destroy your child’s teeth, but it can be prevented. -WHAT CAUSES EARLY CHILDHOOD CAVITIES? +WHAT ARE THE EFFECTS OF EARLY CHILDHOOD CAVITIES? +HOW CAN I PREVENT EARLY CHILDHOOD CAVITIES? Your child’s healthy teeth and brilliant smile depend on you!